The goal of owning a Thoroughbred is to race among the fastest horses in the world, and, in the right hands, the road leads to the winner’s circle at the highest levels of the sport. A fast horse can take people on the journey of a lifetime as its career unfolds with the elements of a great storybook – mystery, drama, adventure, fantasy, romance. Magdalena Racing Partnerships is in the business of making these dreams a reality. Ken McPeek, a consummate horsemen who is respected as one of the premier judges of bloodstock and Thoroughbred pedigrees in the world, leads Magdalena Racing. He ranks among the top buying agents, representing his clients at the elite yearling sales in the country. Owning race horses through a partnerships allows owners the opportunity to get in the game while diversifying their risks and expenses. Each race horse is its own individual sports franchise. Typically, each horse is co-owned with Magdalena Racing, ensuring owners’ confidence and trust that each and every horse is trained and managed properly. The right horse can venture into worlds once only imagined: the thrilling spotlight of the Kentucky Derby, Preakness and Belmont Stakes, or to the gathering of Champions at the Breeders’ Cup. Complete access to our facilities including Magdalena Farm, Saratoga, Belmont, Keeneland, Churchill Downs, etc. Scheduled to ship to Louisville was stablemate Signalman, third-place finisher in the Toyota Blue Grass (G2). Owned by the partnership of Tommie Lewis, Steve Crabtree, Dean Demaree, David Bernsen, Jim Chambers and Magdalena Racing, Signalman would need two defections from horses under consideration for the Derby be in the starting gate for the May 4 race. Trainers report on their charges that ran at Keeneland April 6. Rounding out the field is Lemniscate (post two, Brian Hernandez, Jr., 15-1) for trainer Kenny McPeek who won the Louisiana Derby with Repent in 2002. Owned by Susan Mouton and Magdalena Racing, the son of 2000 Louisiana Derby runner-up Exchange Rate broke his maiden over the turf at Gulfstream Park on March 3 last time out, which was won at third asking. Sure to show some pace in the Louisiana Derby, Lemiscate ran on the lead in both of his last two outings. Prior to his maiden win, he was a close second over the main track at Gulfstream Park on February 9. At Gulfstream, Harvey Wallbanger breezed five furlongs in :59.66 in preparation for a planned start in the Florida Derby. The son of Congrats is coming off a 29-1 upset victory in the $350,000 Fasig-Tipton Holy Bull Stakes (G2) at Gulfstream Feb. 2. The Kenny McPeektrained colt entered the 1 1/16-mile Holy Bull off a maiden victory at Churchill Downs Nov. 17 at 1 1/16 miles. 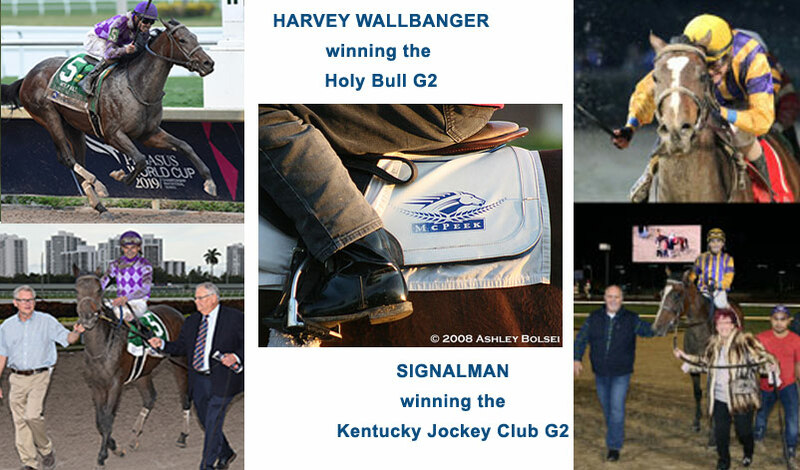 Harvey Wallbanger worked in company with the McPeek-trained Signalman, who finished seventh in the Fountain of Youth after completing a strong juvenile campaign with a victory in the Kentucky Jockey Club Stakes (G2) at Churchill Downs. Signalman, who is scheduled to run in the Toyota Blue Grass Stakes (G2) at Keeneland April 6, was clocked in :59.46 while working outside pacesetting Harvey Wallbanger. FUN FINDER (Cross Traffic) took 1 race to figure it all out and then won easily by over 7 lengths in her second start. She raced a mile on the dirt at Gulfstream. She was selected by Ken for $50,000 at the Fasig Tipton October Sale for his Magdalena Racing (Sherri McPeek) partnership. The selection was a good one as today she ran a determined second in the Boubonette Oaks at Turfway and added the first black-type to her pedigree page. "I think she's still learning," McPeek said of his charge. "I think the last race, she thought she was going one turn and kind of pulled herself up, and today I think she learned a little bit. I think she's got a big future." Kentucky Derby 2019 Radar: McPeek adds a third to the trail? Ridden by: Brian Hernandez Jr.
3 | SIGNALMAN Tommie Lewis, David A. Bernsen, Magdalena Racing/Kenny McPeek General Quarters—Trip South, by Trippi Monticule (KY) Had his first breeze of the year Jan. 26, going three furlongs in an easy :39 4/5 at Payson Park. He’s not going to blow you away with his brilliance, but he is as honest and consistent as they come, having finishing first, second, and third in graded stakes, and has shown he can overcome adversity. He just keeps coming at you, from anywhere on the track. McPeek’s entrants are Honorable Treasure in the card’s first race (post time 9:30 a.m. Eastern) and Harlan Strong in race 5. Honorable Treasure runs in a 1,200-meter dirt handicap, a race probably shorter than his best trip. Honorable Treasure most recently finished third behind Copper Bullet in a Nov. 23 Churchill Downs allowance race. Harlan Strong is one of 11 entrants in a 2,000-meter turf handicap, and as a listed-stakes-class American runner who stays the trip he’s not without a chance, though U.S.-based turf-route horses have long struggled in Dubai stakes races, at least on the World Cup program. FUN FINDER (Cross Traffic) took 1 race to figure it all out and then won easily by over 7 lengths in her second start. She raced a mile on the dirt at Gulfstream. The 2-year-old filly was selected by Ken for $50,000 at the Fasig Tipton October Sale for his Magdalena Racing (Sherri McPeek) partnership. Signalman (Into Mischief – Kenny McPeek – Tommie M. Lewis, David A. Bernsen, LLC, and Magdalena Racing (Sherri McPeek)): Signalman ran second, given little pace to chase, in the Breeders' Futurity and ran third in the Breeders’ Cup Juvenile at 67-1. He broke through in the Kentucky Jockey Club (G2) when coming from off the pace to win by a neck over a sloppy track. McPeek said in a recent Horse Racing Talk podcast the March Fountain of Youth (G2) at Gulfstream Park would be an ideal 3-year-old debut for Signalman. Can Signalman Outrun Purchase Price, Pedigree on Derby Trail? Interesting 2-year-old winner - MOSCOW MINISTER (Power Broker) selected by Kenny for Magdalena Racing - broke in front for a half, dropped back to 8th and then rallied for a 4 1/4 length win. The colt was a $20,000 purchase at the FT October Sale in 2017 and he has already earned over his purchase price. He raced 1 1/16 on the dirt. Of course, the winner's circle was what he wanted, but the McPeek barn is proud to have developed two young horses not only ready to run in Breeders' Cup races, but able to add to their laurels with on the board finishes. RESTLESS RIDER had to settle for 2nd in the BREEDERS' CUP JUVENILE FILLIES-GI, behind freewheeling front-runner Jaywalk, but she got up for the place. for owners Fern Circle Stables and Three Chimneys Farm, LLC Off at long odds, SIGNALMAN rallied from 10th for the show in the BREEDERS' CUP JUVENILE-GI, He is owned by Tommie M Lewis, David A Bernsen & Magdalena Racing (Sherri McPeek). He was selected by Kenny for $32,000 from the FT October Kentucky sale. 2-year-old KING FORD broke his maiden quite easily in his second start. Racing 1 1/16 on the dirt he stalked the pace early and then swung out for the score by 1 1/2 lengths. He is owned by Magdalena Racing (Sherri McPeek) and River Ranch Racing Stables and was bred by Kildare Stud. Tommie Lewis and Magdalena Racing's Claiborne Breeders' Futurity runner-up, Signalman, will remain at Keeneland for the time being. “He'll stay here at Keeneland and probably have his workouts here to prep for the Breeders' Cup,” trainer Kenny McPeek said. “Small chance he'll have one work at Churchill. It'll be a couple weeks until we think about working him, but at this point all the partners are in on entering him and running (in the Breeders' Cup). Runner-up SIGNALMAN ( General Quarters) will train for a trip to the Breeders" Cup Juvenile beneath the Twin Spires. "We came into this really confident," McPeek said. "He had a lot of trouble at the head of the lane. (Jockey Brian Hernandez Jr.) explained it to us and said he got stopped. He said he might have been able to win if that hadn't happened. This horse wants a longer stretch and he has punched his ticket to the Breeders' Cup Juvenile." The colt is owned by Tommie M. Lewis & Magdalena Racing (Sherri McPeek). Watch for him on Breeders' Cup day. Gainesway Stable, Harold Lerner, Andrew Rosen, Nehoc Stables and Magdalena Racing’s Alabama (G1) winner ESKIMO KISSES worked 5 furlongs in 1:00.40 in preparation for the Juddmonte Spinster (G1) to highlight a busy morning with 169 horses on the work tab. Trained by Kenny McPeek, Eskimo Kisses produced fractions of :12.80, :24.20, :35.80, :48.60 and galloped out 6 furlongs in 1:14.20. SALVATOR MUNDI was selected by Ken for Magdalena Racing and purchased for $47,000 at the Fasig Tipton October Sale, Breaking his maiden today going a mile at Kentucky Downs, he has already earned $79,240. The 2-year-old Artie Schiller colt was bred by Conquest Stables, LLC. On the same Woodward Stakes card at Saratoga, SIGNALMAN (General Quarters) sustained a long hard fought drive to win a MSW in his second start. He is owned by Tommie Lewis, Tommie M. and Magdalena Racing (Sherri McPeek). He was bred by Monticule. Keep an eye on this own - he is a fighter. Eskimo Kisses, the 9-1 winner of Saturday's Alabama Stakes, was doing fine at trainer Ken McPeek's barn on Sunday and he is already looking forward to her next start. "She came back with no problems," McPeek said. "She needed to run her 'A' game, and she ran more than that. I'm extremely proud of what she did." For her next start, McPeek said the Grade I Spinster at Keeneland on Oct. 7 could be on the schedule or possibly the Grade I Cotillion at Parx on Sept. 22. One newcomer to the Fair Grounds for the Fair Grounds Oaks is Magdalena Racing, Gainesway Stables and Harold Lerner's Eskimo Kisses, a daughter of To Honor and Serve who will be going for her third straight victory for trainer Kenny McPeek. Both of her last efforts took place at Oaklawn Park when she broke her maiden on Feb.1 and then romped in an allowance race by 11½ lengths later that month. Eskimo Kisses is trained by Kenny McPeek and will be ridden by Florent Geroux who scored a Fair Grounds Oaks win in 2015 with I'm A Chatterbox. She breaks from post four at 9-2. Surprised to see Ken McPeek, readying his top class stock for an assault on Keeneland. McPeek informed us that he is moving a large division to South Florida late this spring and summer, returning to a place where it all began for him. Indeed, McPeek was a graduate of McGaughey University when first starting out. 3-year-old filly ESKIMO KISSES (To Honor and Serve) graduated in a MSW at Oaklawn by a neck 3 weeks ago. Running back in allowance company she was unhurried early and put on the afterburners at the half to explode to a win by 11 1/2 lengths! She is owned by Magdalena Racing (Sherri McPeek), Gainesway Stable and Harold Lerner.WATCH FOR THIS ONE! Already with 2 seconds to her name, 3 year old filly ESKIMO KISSES (To Honor and Serve) got the job done with a rally to graduate in a MSW at Oaklawn by a neck. Going a mile on the dirt she was unhurried early on the rail and then shifted 5 wide for the win. She is owned by Magdalena Racing (Sherri McPeek), Gainesway Stable and Harold Lerner. Newly turned 5-year-old mare GSW WONDERMENT adds still more black type to her resume running third in the La Verdad going 7 furlogs at Aqueduct.. She is owned by Walking L Thoroughbreds and Magdalena Racing (Sherri McPeek). The Cosmonaunt filly was bred in NY by Michael S. Landers. The NY Bred mare has upped her earnings to $387,870.